Hi guys! Christmas is almost here and I still have a ton of things to do. I've done some wrapping, but I still have a ton to do. And I haven't even baked a single batch of cookies yet - eek! I hope you're much more ready than I am. Tonight I have 2 of the 3 limited edition polishes for December from Great Lakes Lacquer. These are available now until Jan. 1st so get 'em while they're hot. If you can get just one of these limited edition polishes, I my pick would easily be Rainbow! Right Here and Now. You guys know my love of grey polishes. Throw in these unique rainbow flakes and you really get something really special. The formula is a crelly, otherwise you would miss the depth of the flakes in there. It was slightly thicker than my other GLL polishes, but I didn't find I needed to bust out the thinner or anything. Shown is 3 coats and topcoat. Well listen, Winter Solstice Sunrise is no slouch either! It's a cornflower blue crelly with shifting blue to purple multichrome flakes. You may be able to get away with 2 coats, but I used 3 to create more depth. 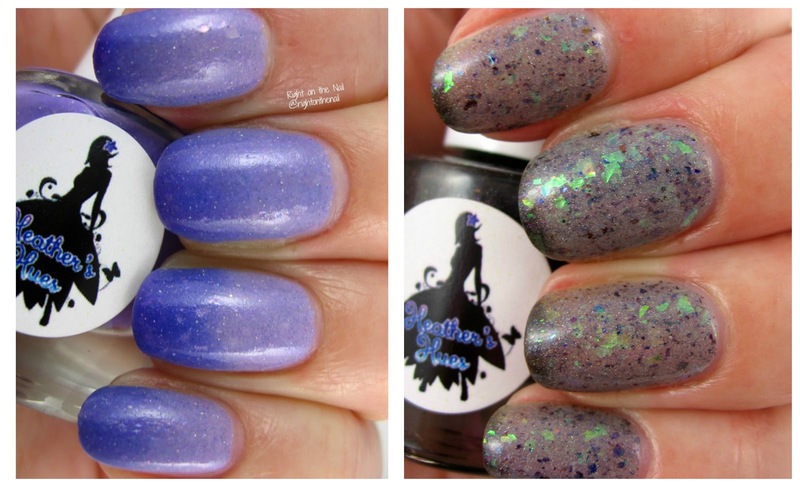 Both polishes retail for $11 each, and are available until Jan. 1st. Great Lakes Lacquer has moved away from Etsy to a BigCartel site found here. There are also some sample prototypes still for sale, so get them while you still can. Make sure to check out what Great Lakes Lacquer is up to on their Facebook and Instagram pages as well. Hi guys! Tonight I have a polish from Great Lakes Lacquer that is no longer available. Every month Mariah has been creating custom polishes for her special bloggers. In November, Mariah welcomed Polish Etc. to the list of custom creations. 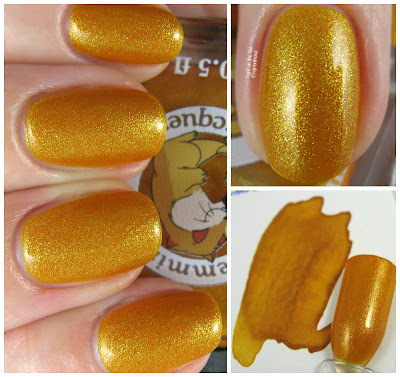 Scruffers is a polish in memory of Amy's dog named Oscar who passed away suddenly. I am super sad about this. I love dogs, and had to give Scraggles a big hug and kiss on the dog head to calm me down. I know others have had custom polishes made in memory of a family member or animal and it's something I'd consider if it suddenly happened to me. Scruffers the polish is a mustard yellow crelly with copper shimmer and gold/copper/magenta ultrachrome flakes. It reminds me a little of my other favorite polish from Great Lakes Lacquer called The Last Sliver of Sun, but with larger flakes and a mustard yellow color instead of a muted yellow. I happen to be a yellow polish fan, and if you are as well, you should look for this on destashes. I used 3 coats for full coverage, but if you don't mind a tiny big of VNL, you could probably get away with 2. Like all of my GLL polishes, the formula was perfect. Great Lakes Lacquer has moved away from Etsy to a BigCartel site found here. There are also some sample prototypes still for sale, so get them while you still can. Make sure to check out what Great Lakes Lacquer is up to on their Facebook and Instagram pages as well. Nibs & Nails Presents Lemming Lacquer Pools of Golden Sand (Inspired by Diamine Ink): Swatches and Giveaway! Hi guys! Welcome back to another installment of Nibs & Nails. You know, the segment where I ask indie makers to dupe (or just be inspired by) popular fountain pen inks. I know it has been a hot minute since I've posted one of these, but you know...holidays. I wanted to make sure to get another giveaway started before next week so here we are. Today we are featuring a popular indie maker named Lemming Lacquer. If you aren't a part of the beauty world, you may not know what a lemming is. A lemming is something you want really bad. In all actuality, a lemming is a cute little rodent much like you see on the Lemming Lacquer label. I have no idea how the lemming rodent started to describe a highly sought-after product, but the internet, I guess. Anyway, I really started lemming Lemming Lacquer when the owner, Cassie, made a huge Archer collection. My husband is the biggest Archer fan and I think she did an awesome job with the inspiration. Today's fountain pen ink we are duping is from the Diamine Shimmertastic collection called Shimmering Sands. To see more pictures and a review of the ink, head over to my husband's blog Inkdependence. Make sure to stay tuned to the end of the post for a chance to win this polish! Come on, how did Cassie do it? The polish Pools of Golden Sand is pretty much an exact dupe of the Diamine ink. You can see how the ink can take on a mustard color in more saturated areas and a lighter gold in areas with 1 pass of ink. It is harder to see the shimmer in the ink in my photos, so make sure to stop by Inkdependence for better pictures of the ink. For once, the matte version of the polish makes it even closer to the ink. I used 3 coats for the photos above, but you could definitely get away with 2. I used the 3rd coat to add some depth and to make the shimmer really pop. I enjoy the shape of the Lemming Lacquer bottle. Most indie brands use the same cylindrical shape, so I like brands that like to step outside the box (i.e. Great Lakes Lacquer, Lemming Lacquer, Femme Fatale). The formula was quite fantastic, and I really liked the long, flat brush. If bath and body products are more your style, Cassie also has has scrubs, lotions, cuticle balm, and mani bombs available. Overall, I'm really impressed with Lemming Lacquer. Unfortunately Pools of Golden Sand will not be available for purchase in her store. On the bright side, I have 1 bottle (and a couple mani bombs) to give away to 1 lucky winner! Please let me know if you have any questions. 5. One winner will be chosen randomly by Rafflecopter. They will have 48 hrs to respond before a new winner is chosen. Hi guys! Welcome back to some more reviews from Heather's Hues. Unfortunately these aren't for sale anymore, but you can find many more beautiful polishes on her Etsy site. These were part of a duo that was made specially for Heather's birthday last month. Shall we see some more pictures? As you could guess, 11/7 is Heather's birthday! If you know anything about Heather, you know she knows her way around a purple polish. 11/7 is a lavender to blurple thermal with a subtle scattering of holo and flakes. Most of the time it was the lighter color, but my nails weren't too long at this point. The formula was slightly thicker than most of the other Heather's Hues polishes, but nothing too serious. Party Like a Rockstar is my pick of the duo and transitions from a light grey (warm state) to black (cold state) with tons of holo shimmer and multichrome flakes. Man, the flakes just glow in this one! If you can find this in a destash, you should definitely pick it up. My only slight issue I had was that it was pretty sheer and needed 3 heavier coats for full opacity. While you're at the site, make sure to check out her Cutie-cle oil and balm! You don't need very much and it doesn't leave your fingers all greasy. Also new on her site are her wax melts, body sprays, and lip balms which I still need to try. You can find out more about Heather's Hues on their Etsy site, Instagram, and Facebook pages. Also, don't forget to sign up to be a part of Heather's Hue-t-pies Facebook group! Hi guys! I just started watching Amazon's The Man in the High Castle last night and I've already been sucked in. The story takes place in America in 1962. The catch? We happened to lose WW2 and Nazi Germany owns part of the US, Japan the other. Interesting, right? Tonight I have the second half of the Zoya Enchanted Collection with 1 PixieDust and 2 shimmers. Oh, and my Zoya Black Friday order has shipped and should arrive Friday or Saturday (probably Saturday with how slow shipping seems to be getting). Shall we get started? Hi guys! I can't believe it's Thursday already! I'm anxiously awaiting my shipping notices from some of my nail purchases last week. I got my Polish 'M order yesterday, and I am continually impressed with the formula and complexity of Michelle's polishes. Tonight I am finally finishing up the Positive Vibes Collection. Hey, it's a big collection! Shall we get started?